Maybe the biggest surprise from the first few weeks of the 2012-13 NHL season is this: There aren't that many surprises. Sure, some teams are off to better or worse starts than expected, but outside of the Anaheim Ducks challenging for the top spot in the Western Conference and essentially having the Montreal Canadiens and Washington Capitals swap Eastern places, no team is more than a couple of victories away from either where it was at the end of last season or where most pundits expected it to be. The defending Stanley Cup champions are in 13th place in the West, but the Los Angeles Kings also are a couple of games-played short of most of the field. As for individual accomplishments, take a look at the League's scoring leaderboard and there are a lot of familiar faces at or near the top. Buffalo Sabres forward Thomas Vanek setting the pace is a slight surprise, but he's an elite player who has proven he can score in bunches. 1. Viktor Fasth: This is an easy one. Fasth hadn't played a game at Sweden's highest level before two seasons ago. After two seasons in the Elitserien, Fasth signed with the Anaheim Ducks to back up Jonas Hiller. At 30 years old, Fasth is too old to be a Calder Trophy contender, but he has been the top newcomer in the League. He's 6-0-0 with a 1.74 goals-against average and a .933 save percentage, and is making a serious play for the starting job. If he keeps up this level of play, he'll be in contention for the Vezina Trophy. 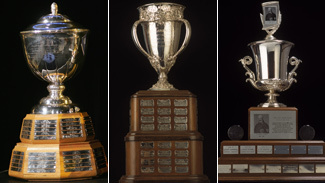 The NHL Awards won't be determined for serveral months, but NHL.com takes a look at the front runners for each award as we end the first quarter of the 2012-13 season. Who should be patient and who should panic? 2. The Parise-less Devils: The New Jersey Devils lost their best player in the offseason, one of three teams that probably can make that argument (along with the Columbus Blue Jackets and Detroit Red Wings). The Devils, who made a surprising run to the Stanley Cup Final last spring, didn't really replace Zach Parise either. Yet, here they are, atop the Eastern Conference after Wednesday's games. New Jersey started 8-2-3, and Martin Brodeur is still playing like one of the League's best goalies. The Devils' depth will be tested further with Dainius Zubrus out with a wrist injury, but they have added Andrei Loktionov and Alexei Ponikarovsky in recent days. 3. Leaks in St. Louis: After Ken Hitchcock became St. Louis Blues coach last season, they became one of the stingiest teams to play against. Jaroslav Halak and Brian Elliott formed a fantastic goaltending tandem, and the Blues suffocated opponents. That hasn't been the case this season. The Blues are yielding 3.23 goals per game, 24th in the League. Halak has been injured and Elliott has disappointed. None of the three goalies Hitchcock has used (including prospect Jake Allen) has a save percentage above .889. Lately, captain David Backes has been critical of his teammates. On paper, the Blues might have the deepest roster in the NHL, but they're eight points behind the Chicago Blackhawks and clinging to a place near the back of the top eight in the West. 4. Goalie, uh, harmony in Vancouver: The Vancouver Canucks began the season without two of their top six forwards, but still with two of their top two goaltenders. That wasn't supposed to happen -- Roberto Luongo was supposed to be in Toronto or Florida or Chicago or anywhere a team was short an injured goaltender. Instead, Canucks general manager Mike Gillis hasn't found a trade offer to his liking; the team's third-string goaltender, Eddie Lack, is injured; and @Strombone1, err, Luongo has become a fan favorite again in Vancouver. Oh, yeah, the Canucks also are still ruling the Northwest Division despite playing without Ryan Kesler or David Booth (although Kesler could return Friday from offseason shoulder and wrist surgery). Luongo and Cory Schneider have been great in net, regardless of who gets a couple starts in a row, and the defense (Alex Edler in particular) looks like one of the League's best. Vancouver and Chicago have had some great Stanley Cup Playoff battles in recent seasons and might be the class of the West this season. 5. Forward depth in Toronto: Goalie James Reimer played well before getting hurt recently, and that's the biggest reason the Maple Leafs are inside the top eight of the East. But how many games would pundits have expected this team to win if they knew Phil Kessel and Joffrey Lupul would combine for two goals in the first 13 games? Lupul played three games before breaking his arm, and Kessel has been unlucky, but the Maple Leafs still are filling the nets. James van Riemsdyk, Brian Burke's last big acquisition before being removed as GM, leads the team with eight goals. Matt Frattin has seven despite starting the season in the American Hockey League. Nazem Kadri finally looks like the elite talent he was when the team drafted him. There is plenty of forward depth to go around, and the Maple Leafs might score their way back into the playoffs even if the goaltending slips a little. 6. Defense in Denver: Restricted free agent Ryan O'Reilly still hasn't arrived and reportedly may never play for the Colorado Avalanche again. Injuries have sidelined captain Gabriel Landeskog and Steve Downie, a key in-season acquisition from 2011-12. Colorado could struggle to score without those three, but somehow the Avalanche have as many goals from their goaltenders as they do their defensemen (zero). The eight defensemen who have dressed for the Avalanche have combined for no goals and eight assists in 11 games. Eleven NHL defensemen have more points than the entire Colorado corps combined. The Avalanche need more offense from the blue line with key forwards missing, but instead they're getting a lot less. 7. Raphael Diaz: Speaking of defensemen who have outscored the Avalanche, Diaz had an opportunity to log heavy minutes on the Montreal Canadiens' power play when P.K. Subban began the season without a contract. Diaz racked up eight points in the first six games and has nine in 12 games. Subban is back, and the Montreal defense looks a lot deeper with a healthy Andrei Markov and an improved Diaz. It is a big reason the Canadiens are in the top eight in the East after finishing last season at the bottom of the conference. 8. Grounded Flyers: Scoring has not been a problem in recent seasons for the Philadelphia Flyers. Sure, Jaromir Jagr and van Riemsdyk went elsewhere this offseason, but the Flyers still looked like a deep group up front. Even with Scott Hartnell's injury, it is a surprise to see Philadelphia scuffling to find offense. The Flyers are 22nd in the League at 2.43 goals per game. Captain Claude Giroux has three goals and eight points in 14 games. No one has more than five goals or 10 points. If it wasn't for the often stellar play of goalie Ilya Bryzgalov, the Flyers might be in serious danger. 9. Corey and Craig: Corey Crawford spent the offseason and the lockout reading (or avoiding) how the Blackhawks lacked an elite goaltender. Craig Anderson supposedly is a placeholder until one of the Ottawa Senators' top goalie prospects was ready. Well, Anderson and Crawford have been two of the best goalies in the League. They are second and third, respectively, in goals-against average, and are in the top five in save percentage. The Blackhawks are 10-0-3, and the Senators are in the top eight in the East despite losing several key players to injury, in large part because of these goaltenders. 10. Garden power outage: When New York Rangers coach John Tortorella put Rick Nash on a line with Brad Richards and Marian Gaborik, the one-game flash of magic felt like a seismic shift in the NHL. The defense-and-goaltending-first Rangers had a trio that could dominate at the offensive end. It hasn't really worked that way consistently, and the Rangers barely are in the top eight of the East after 12 games. Nash, Gaborik and Richards have combined for 28 points, but the depth scoring has lagged. Most problematic has been the power play: The Rangers are 29th in the NHL, converting 9.1 percent of their extra-man opportunities. There's far too much talent for New York to not be better in that department. 11. Dougie Fever: Other rookies have scored more points and played more minutes, but Boston Bruins defenseman Dougie Hamilton has garnered plenty of press for the strong start to his NHL career. Edmonton Oilers defenseman Justin Schultz is playing more than 23 minutes a night and has four goals, but his team had a big need for some offense from the blue line. Hamilton is logging nearly 19 minutes per game, third among rookie defensemen who have regular roles. He hasn't looked out of place and doesn't turn 20 years old until June. Some of the hype might be over the top, but the Bruins are quite happy to have him. 12. Capital crisis: Much has been written on the Washington Capitals and their slow start. They have a new coach with new systems and didn't have a full training camp to fine-tune them. A couple of key players, forward Brooks Laich and defenseman Dmitry Orlov, have yet to play because of injury. Still, losing eight of the first 11 games (2-8-1) was not the start anyone expected. Stars Alex Ovechkin and Nicklas Backstrom did not carry the offense but have looked better in the past few contests. The two young goalies have disappointed. The defense has problems beyond the top three. Back-to-back wins against the also-struggling Florida Panthers helped, but the Capitals still don't have a win against a team in the top nine of the East.